A few weeks ago I started the Graduate Certificate in Digital Technologies in Design Art Practice" at Montreal's Concordia University. The goal of this part time program is to develop an individual research project in design and/or art. The projects is accompanied by theory courses, such as Theories of Interactivity or the 'Language, Politics, Manifestos - Reading Seminar'. Joey Berzowska, who is teaching Theories of Interactivity, motivated our class to blog about our reflections retrieved from classes and readings to have a kind of personal documentation. I am glad she did, otherwise, I think, I wouldn't take the time to do it, besides a full-time job, volunteer projects and other commitments. One of our main course readings is Designing interactions by Bill Moggridge, who introduces us to 40 influential designers. 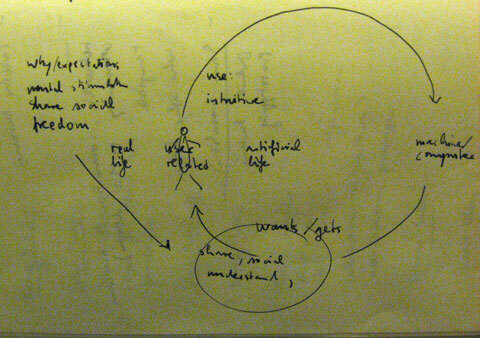 After some chapters of readings we discussed in the class of September 26, 2007 'what interaction means'. The term is that broad that everyone interprets it in a different way. We are encouraged to use diagrams and drawings to demonstrate our ideas. In my case, I set the human being in the center of two realities, which are percept with our senses hearing, sight, taste, touch, and smell. In the artificial reality man interacts with a machine. This machine allows us to share knowledge, to understand things better, give us some freedom, mental stimulation and so on. It is also useful to create and develop human relationships. The circle Human being - machine closes at its starting point, the human being. Summarizing, the artificial world generates all we need for our real life, like social networking, the sensation of being free, etc. Joey showed us the method of working with ideation, a process of generation ideas. 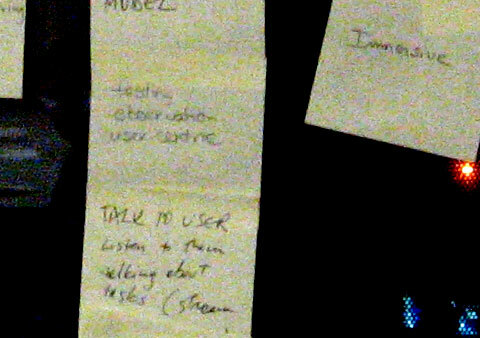 In one session she asked us to write down the most interesting interactive piece we have seen so far on a post-it sticker. We were also asked to choose two adjectives, which reveal the action, and two adjectives, which concern the human issue of the selected artwork. One by one presented his thoughts. I talked about an interactive digestive table, which I had seen on we make money not art and which represents for me an accessible and practical and also environmentally friendly and useful piece. 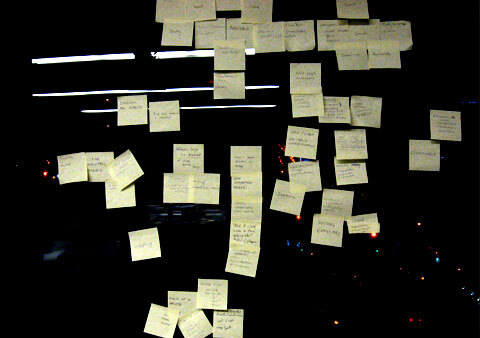 In an other structured brainstorming session we were asked to write adjectives, which refer to interactivity, in particular device and human centric on post-its, which we would glue on a wall. We tried to and create mental relationships in between the expressions on the classroom window.